Being the quick thinker you are, you remember that you’ve got a batch of mouth-watering cookies that are fresh out of the oven. You need a way to restrain yourself from eating the entire batch anyway, so you decide to give some of the cookies away as a snack for the party. Which is it? Is it bring or is it take? Take a guess because we’re about to set the record straight about when to use bring vs. take. Bring vs. take are words that many people use interchangeably. But they are, in fact, separate words. It’s true that both describe transporting something to another location. However, you need to use one vs. the other depending on the situation you’re describing. Let’s talk about when to use each one. Bring is the right word for these sentences because they describe moving an object (i.e., the sweater, payment, or notebook) closer to someone (i.e., you or the speaker). In sum, when you’re thinking about the difference between bring vs. take, remember that bring is the word to use when you’re talking about moving something toward someone. 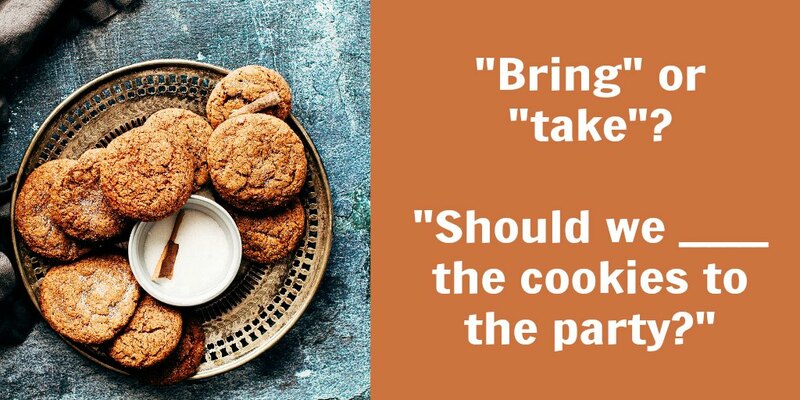 Take is the right word for these sentences because they describe moving an object (i.e., the cookies, suitcase, or offer) away from someone (i.e., the speaker). In sum, when you’re thinking about the difference between bring vs. take, remember that take is the word to use when you’re talking about moving something away from someone. It can be hard to keep bring vs. take straight, but we’ve got a trick that can help: Note that take is part of the term “take away,” as in the thing you want people to remember after they leave your presentation or navigate away from your blog post. That’s how you can remember that take is the word you use when you want to describe something moving away from someone. Bring vs. take are simple English words, but it isn’t always easy to remember how to use them correctly. Use bring when you want to say that something is moving toward someone. And use take when you want to say that something is moving away from someone. Used vs. utilized: What’s the difference?